Mate Precision Tooling, Anoka, MN, introduces the Versadie thick turret insert slitting die for D and E stations. The design takes clamp clearing operations to a new level by reducing material cost and waste for slitting operations by punching closely to the clamps, and by allowing users to replace die inserts without replacing the entire slitting die. 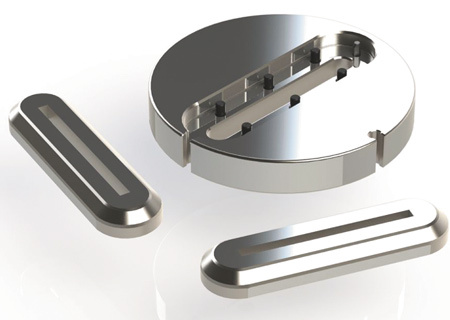 Further enhancing productivity, Versadie features easily replaceable die inserts that accommodate lengths to 4.560 in. for E stations and 3.560 in. for D stations. The insert is manufactured from MPM82 high-speed particle-metallurgy tool steel; the die body, easily shimmed after the insert is sharpened, is of S7 shock-resistant tool steel. Versadie is available in metric and inch sizes in standard rectangle, oval and double-D shapes. Special-order designs are available.